A time-tested and reusable classic! 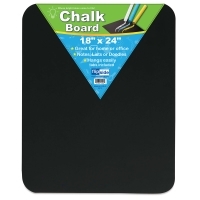 Flipside Frameless Chalkboards are the perfect size to store in student desks or notebooks. They can be used for handwriting practice, working equations, brainstorming, doodling, and more. The frameless chalkboard features rounded corners and smooth edges for safety and comfort. The durable hardboard backing resists warping and chipping. 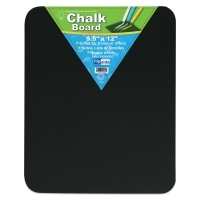 Can be used with white or colored chalk, which erases easily with a felt eraser. Adhesive squares for mounting are included. Frameless Chalkboard, 9½" × 12"